Rough-cut your pieces to approximate size so you can joint and plane them all with the same machine settings. When the 3/4″-thick material is complete, reset your planer and bring the frame facings to 7/8″ width. Orient them so the oak’s ray flecks show on the 7/8″ face. Plane the drawer faces and tabletop to 7/8″ thick. Prepare more wood, this time for the legs. Make each of your legs a little longer and wider than necessary at first. I laminated mine from three pieces of oak per leg, followed by a 1/8″-thick layer of quarter-cut oak veneer glued on top to hide the lamination lines. Just be sure to use strips of scrap wood under your clamp jaws to spread pressure over the 1/8″ strips. Trim and plane them to final size, using the same machine settings for each. All panels in this project are 1/4″ thick. If you don’t have boards wide enough, you’ll have to glue up the panels, but this is actually an advantage. It gives you the opportunity to bookmatch your panels. Find the best final size for the panels later, by dry-fitting them after you’ve completed the frame assembly. To allow for seasonal expansion and contraction, make your panels a little undersized. Joint and trim all the rails and the kickplate to final width. Square up one end of each part. With a 1/4″ dado set in your tablesaw, cut the panel grooves in the rails. They need to end up being 3/8″ deep. I took three passes to achieve this, making each pass 1/8″ deeper than the previous one. The legs require grooves since they act as stiles supporting the panel edges. But since these grooves don’t travel the entire length of the leg, you’ll need to stop them 2 3/4″ from the bottom ends. A table-mounted router with a 1/4″ spiral bit works well for this application. Set up a fence and a stop block to keep you from going too far. White oak is quite hard, so limit yourself to no more than 3/8″-deep cuts in multiple passes. The Mortises come next. Most are located within the grooves you have already cut in the legs. Refer to the plans for height and depth figures. Regardless of the mortising method you choose, it’s important to test your machine set-ups with scrap before moving on to your chosen lumber. Note that the kickplate stands alone in its mortise and doesn’t sit in a panel groove. Prepare to cut the matching tenons by reading “Tenon Technique” on page 45. For this project, you need to cut 1/4″-wide x 1″-long tenons on your rail ends, leaving a 1/4″ shoulder on each side. Once again, use scrap pieces to test, checking tenon fit in the mortises you cut earlier. Once you’ve cut the sides of the tenons on all the rails and the kickplate, raise the blade to a height of 3/8″ and cut the bottom shoulders on all tenons. You can cut the top shoulders of the lower rails and kickplate as well, but leave the top edges of the top rails for now. The top rails have a haunched tenon to accommodate the slot in the legs. 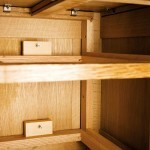 Mark your tenons 3/8″ in from the shoulder and 3/8″ down from the top. Remove the waste with a fine-tooth handsaw. Once you’re satisfied that your mortise-and-tenon joints fit, sand all parts up through the grits from 120 to 220. Sanding your project parts before assembly is much easier than if you wait until after they have been joined, screwed and glued; with an assembled project, you have corners and cross-grain to contend with. File and sand a small bevel on the bottom edges of the legs to prevent splintering if the table is dragged across the floor. 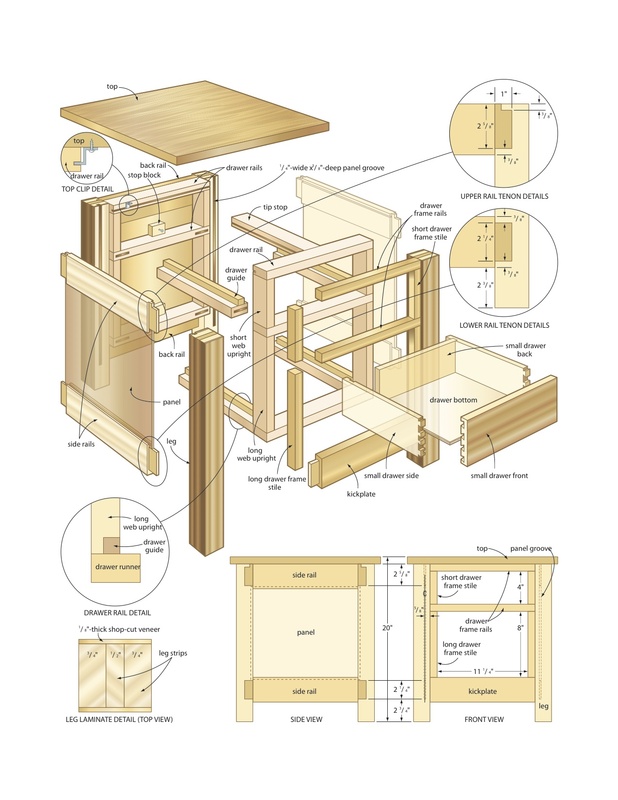 There are three web frames to build-one to support the lower drawer, one to support the upper drawer, and the third to act as a stop, preventing the upper drawer from tipping down as you pull it out. 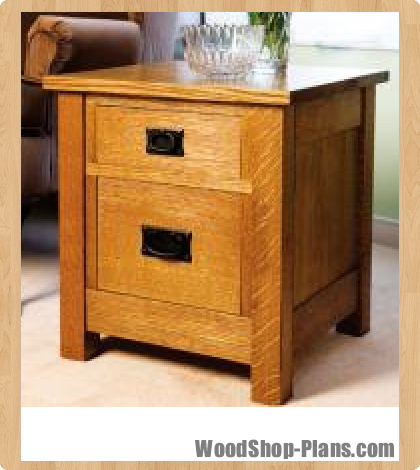 Use paint-grade hardwood, such as poplar, for these hidden parts. The frames are separated by uprights that are the same height as the drawers. You’ll need to drill and counterbore the uprights to accept #8 x 2″ screws to attach the assembly to the legs. Before bringing the web frame parts together, set up and cut a groove in all upper frame pieces to accept metal tabletop clips. Once you’re done, bring all the parts together with #10 biscuits. 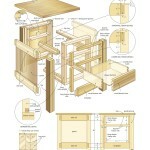 As you assemble each frame, take the time to ensure it’s square- successful drawer fit depends on it. 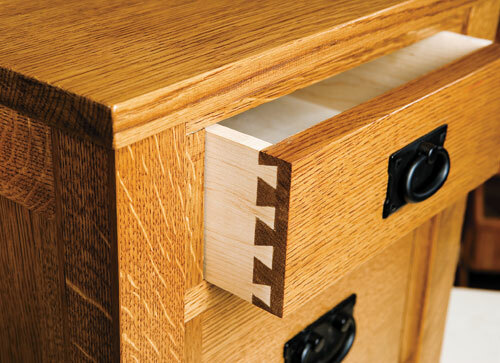 Keep all web-frame joints flush, so the drawers don’t snag. After each frame is assembled, use a portable belt sander to smooth over any raised edges or protruding biscuits. Next, join the completed web frames with the uprights. 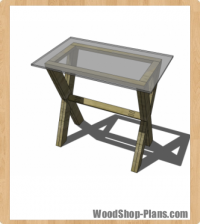 Attach the top frame to the uprights using #8 x 2″ wood screws for strength. Put one in each upright in place of biscuits. Set the drawer guides on the runners between the uprights. They only need to be 1/2″ x 1/2″, but you can make them bigger if you wish. Be sure that there’s a smooth transition between the guides and uprights. If not, it will be hard to coax the drawers to fit. Attach your outer frames to the front face of the web framing. They need to be sanded through all the same grits as the rest of the project for even staining and colour. Again, it’s easiest to do this step before you glue them in place. Sand only exposed surfaces, not those that will be glued. Next, drop the web frames in place. The top frame should be flush with the top of the cabinet, and the lower piece should fit behind the kickplate. Drill pilot holes and install eight #8 x 2″ screws to join the uprights to the legs. You’ll be extremely lucky if you can find a single board wide enough for the 18 1/4″ x 18 1/4″ top, and even if you did, you might want to consider resawing and laminating the board to boost seasonal stability. Glue and trim the top to size, sand it completely, including the edges and at least the first inch of the perimeter of the underside. Set the top upside down on your bench, centre the table upside down on it, then position your tabletop clips. I used 10 of them, spaced evenly around. Mark the screw hole locations and predrill, but be careful not to bore right through the top. I used #10 x 5/8″-long screws. As with any handmade project, your actual drawer opening dimensions will vary from mine. That’s why you need to custom-cut the drawer parts. 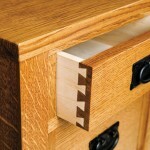 I used hand-cut, half-blind dovetails to attach the sides to the fronts, with the backs and bottoms held in dado slots. Begin by trimming the drawer front to fit. Trim your sides to a height that matches your opening, and cut them to length. 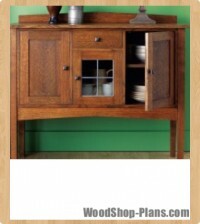 Join the drawer fronts and sides. Cut 1/4″-deep x 1/2″-wide dados in the sides for the backs on your tablesaw. Next, without changing the blade height, set your fence for the bottom slot. This should be about 1/4″ from the bottom edge, but, more important, it must also be centred on the lower dovetail pin. This way, when the drawer is assembled, the bottom won’t peek out at the corner-the tail will cover it. Cut this dado in both sides and the front. The drawer back rests on the bottom panel, so it doesn’t need a groove. Test both drawers for fit, then assemble with glue. Glue isn’t required for the bottom panel-it simply slides into position. You can pin the bottom to the back with a small finishing nail later. Clamp your assembly and confirm that it’s square. Take some time with this, as an out-of-square drawer won’t slide well and it will look crooked on the face of the cabinet. I usually clamp a shopmade wooden square into each corner before finally tightening the clamps to make sure the drawers are true. When it comes time to mount your drawer hardware, you may have to cut the mounting bolts. 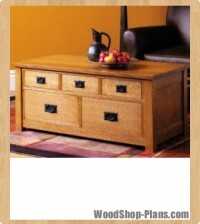 Many knobs and drawer pulls come with 1″-long bolts for use on drawers with separate faces. Traditional drawers such as the ones for this project require shorter bolts. 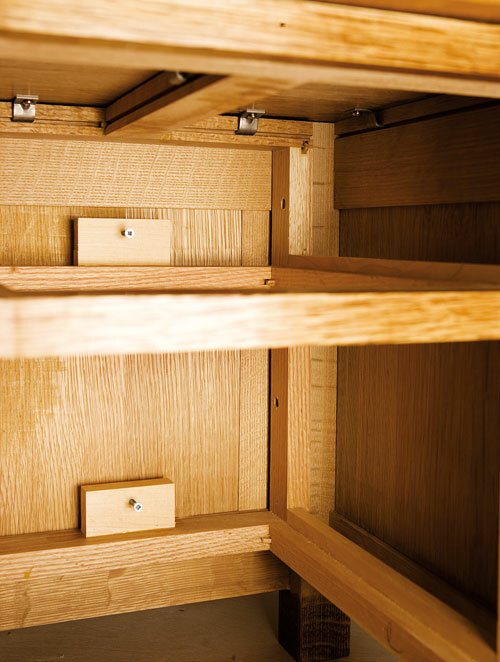 You’ll find the drawers about 1 1/2″ shorter than their openings, so they’ll sit recessed into the frame. To keep the drawers from sliding too far into the cabinet, glue small stop blocks to the back rails. 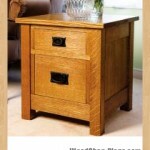 These stops are drilled and fitted with 1 1/4″-long wood screws for adjustment purposes. Turn them in or out until the drawer faces sit perfectly flush with the surrounding face frame. 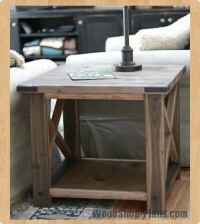 When your end table is ready, carry it into place. If you haven’t built the matching coffee table yet, you’d better dig out that September 2006 issue. It won’t be long before that project makes it onto your to-build list.